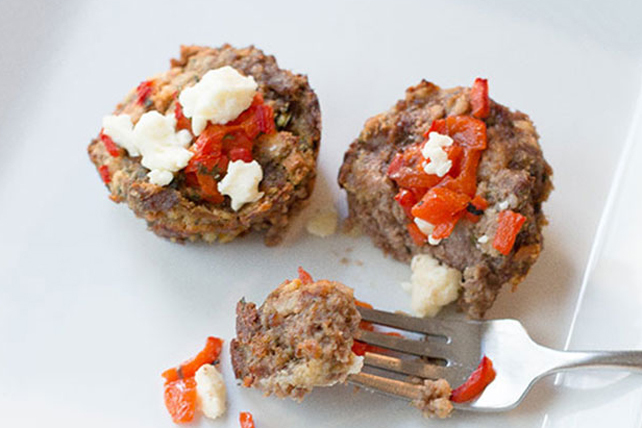 Red peppers and crumbled feta give these moist and marvelous mini meatloaves their Mediterranean-style appeal. Mix first 4 ingredients until blended; press into 12 muffin cups sprayed with cooking spray. Use back of spoon to make indentation in centre of each meatloaf; fill with peppers. Bake 30 min. or until meatloaves are done (160°F). Top with cheese; bake 5 min. or until melted. Serve with hot steamed seasonal fresh vegetables. Stir 1/2 tsp. minced garlic into meat mixture before pressing into prepared muffin cups and baking as directed.